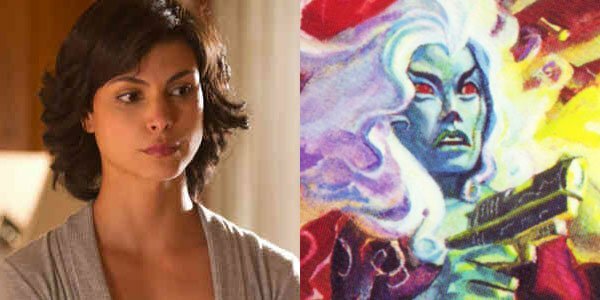 As you can probably tell, that Tweet comes directly from Morena Maccarin herself, and it reveals that she will be playing Vanessa Carlysle in Deadpool, a character perhaps better known by her alias Copycat. She is a shapeshifting mutant who experienced a hard early life and worked as a prostitute in Boston. The only shining light in her life is her mercenary boyfriend, Wade Wilson (the future Deadpool), but he breaks her heart when he discovers that he has cancer and leaves her. After this, she turns into a mercenary herself. At this time, it's unclear exactly how much of this backstory will be translated into the film, but given Ryan Reynolds' recent promises, it wouldn't be shocking if the film follows that exact same arc for the character. Helmed by first time feature director Tim Miller, and based on a screenplay by Rhett Reese and Paul Wernick, and for those keeping track, Deadpool has now confirmed Ryan Reynolds as the titular character, the aforementioned T.J. Miller as Weasel, and Gina Carano as Angel Dust in addition to Morena Baccarin as Vanessa. It was also reported back in January that Transporter: Refueled star Ed Skrien will also be in the movie, but it has not yet been said who he will play (the most common theory is that he will be playing Ajax a.k.a. Francis, the film's central antagonist). Of course, these five actors can't be the only ones who are going to be in the movie (where's Blind Al? ), so hopefully we will also start hearing a lot more casting announcements very soon. Deadpool is expected to shoot over the the course of the next few months, and 20th Century Fox has scheduled the movie to be released on February 12, 2016 (the first of three Fox comic book films to come out next year, along with Bryan Singer's X-Men: Apocalypse and the upcoming Gambit solo feature starring Channing Tatum).